Watching a bunch of YouTube videos regarding building a table, it seems the “gold standard” is the use of a Domino from Festool. What is the real difference between a domino vs a dowel of the same size? What about 2 x dowels right next to each other? The idea that Domino joinery is stronger than dowel joinery is erroneous in my opinion. It depends on the situation. When Festool makes the comparison, they use one Domino and one dowel. Of course, that is just stupid. A person can use as many dowels on a joint as he can physically make holes for. I use the Dowelmax jig and it makes it easy to put an array of dowels to do the best job for the particular joint you are working on. I haven’t used a Domino cutter but it seems like a nice, if wildly overpriced, floating tenon cutter. I just don’t think it can make a stronger joint than a skilled user of a good dowel jig. If you go on the Dowelmax website, you can see comparisons of various joint methodology with calibrated destructive testing. I think the Domino is among the methods. Of course you have to consider the source but that is true of the Festool claims as well. “Strongest” is often a meaningless term anyway. In most cases, all the joinery techniques are gross overkill and you would need to do incredible violence to a project to tell any practical difference after it is complete. You’re comparing loose tenons to dowels. While I’d bet using the Domino for loose tenons would be easier, I’d also bet the difference in strength is strictly academic. I’m a beginner, so excuse the ignorance, but isn’t a dowel simply a round floating tenon? Dowel joinery has been around for hundreds of years. It is up to the user as to how secure the joint is. 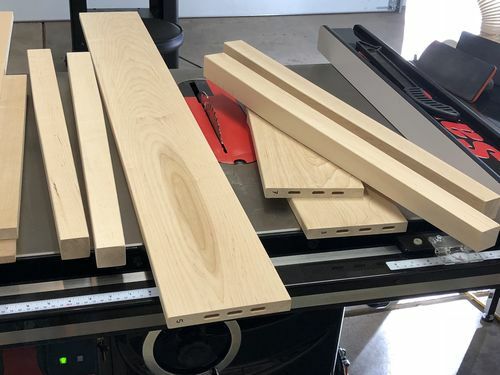 Convenience (domino) is one thing, but good joints can be made using dowels. The domino just substitutes convenience for skill. Personally, I like the idea of perfecting a skill over depending on a machine to do it for me. I m a beginner, so excuse the ignorance, but isn t a dowel simply a round floating tenon? Dowels were around long before the Domino. Perfectly suitable. But, I will tell you the Domino was a game changer for me in my shop. One big advantage to the Domino is if you make the opposite insertion slot one size wider than the domino, alignment is much easier. The Domino was a complete game changer after 18+ years of a variety of projects. Your work should be strong enough without a dowel or a domino. Neither is meant to make wood stronger. For lining up, joining, and the flexibility of the domino… this is a great tool. Get the right size to your average workpiece. I have the 500 and it does a fine job, for large farm tables you would want to XL. If I get to that point, I will buy the larger one in addition to mine. I was able to prep all the parts for my last project within about 30 minutes including marking, drilling, and testing and everything was perfect when I dry fit it. So just to add a wrench in the gears, how about domino to biscuit? I can see doing dowels somewhere a little bit of strength is required but if it for alignment of panels is there a benefit to the domino over biscuits? Seems like setup and use time would be about the same. I “think” the domino simply brings speed, accuracy and convenience to the game. We have been making great furniture for centuries without it, so it is not anything new (floating tenon is just that). So if you want to make fast accurate floating tenons, they are hard to beat. I don’t have one, but if I did I would use it from time to time. There are a number of popular YouTube woodworkers that are doing projects with them, so folks think that is how it is done. The joint could just as easily have dowels or floating tenons or just a regular mortise and tenon. I do have to say that prior to dropping over a grand on a hand tool for floating tenons, I would buy a much better hollow chisel mortiser for the shop. I like dominos better then dowels. The weird thing with dowels is they seem like they are too loose or too tight.